Some great photos there, Thanks Giana! I can't get enough of these pics. Thank you. Thanks Giana; almost all so great... !! Grumpy is the cutest cat. We should all enjoy him. There are many other beautiful pictures. I especially like the animals, giraffes, kangaroos, & panda for some. Most of the human pictures showed the ugliness of man. Loved the animal pictures. Too bad so many of them were of captive animals. Loved the lighthouse picture. It was a picture of hope. Sir Paul...my favorite of the fab four whom I share a birthday. As always, very enjoyable, Giana. WOW! Thanks so much for sharing, Giana. 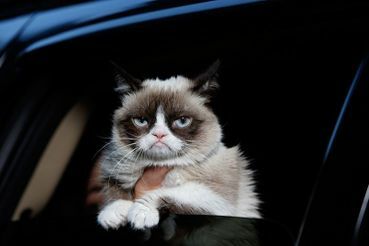 grumpy cat: "you forgot my fries with my order!" You cannot currently send a star to Giana because you have done so within the last day. Colourful photos bringing about many emotions. The pictures of the animals are great.